Scientists are increasingly tuning out the claims that the Earth’s temperatures are predominantly shaped by anthropogenic CO2 emissions, or that future climate is destined to be alarmingly warm primarily due to the rise in trace atmospheric gases. Instead, solar scientists are continuing to advance our understanding of solar activity and its effect on the Earth system, and their results are progressively suggestive of robust correlations between solar variability and climate changes. For example, in 2016 alone, there were at least 132 peer-reviewed scientific papers documenting a significant solar influence on climate. 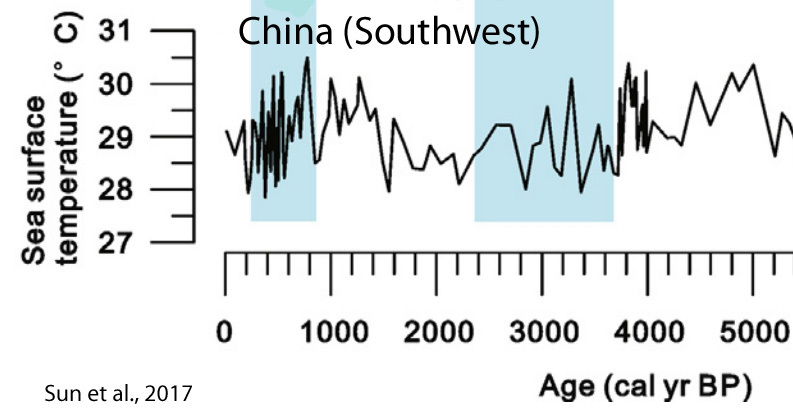 Among them there were 18 papers that directly connected centennial-scale periods of low solar activity (the Little Ice Age) with cooler climates, and periods of high solar activity (the Medieval Warm Period and the Modern Warm Period [20th Century]) with high solar activity levels. Another 10 papers warned of an impending solar minimum and concomitant cooling period in the coming decades. And this trend of scientists linking climate changes to solar forcing mechanisms — and bypassing an anthropogenic explanation — continues to rage on in 2017. In their groundbreaking New Astronomy paper, Norwegian professors Harald Yndestad and Jan-Erik Solheim indicate that the modern (1940-2015) Grand Maximum of very high solar activity — the highest solar activity levels in 4,000 years — has just ended. Within 10 years, or by 2025, these scientists project the next solar minimum period (which will be similar in character to the late 18th Century’s Dalton Minimum) will exert its cooling effect on the Earth’s climate. Yndestad and Solheim have been working together on this project for more than 2 years. Although Dr. Yndestad was “skeptical about the idea of ​​sunspots as climate indicators” initially, the two discovered “for the first time” a strong long-term correlation between Total Solar Irradiance (TSI) and sunspots for periods of 84 and 210 years, confirming the “Cause of causes” of climate change. Details can be found in their illuminating new paper. Other scientists have just published papers in peer-reviewed journals documenting a robust correlation between solar activity and surface temperatures in the paleoclimate record. Zawiska et al. (2017) have found that the amplitudes of the warming and cooling periods — modulated by changes in solar activity and the North Atlantic Oscillation (NAO) — during the last 1,000 years far exceeded the temperature changes that have occurred since about 1950, or since anthropogenic CO2 emissions began rising at an accelerating pace. For example, these scientists point out that within a matter of 100 years (1050-1150 to 1150-1250), summer temperatures rose from 9.2°C during a low solar activity period (Oort Minimum) to 12.0°C in concert with the subsequent rise in solar activity. 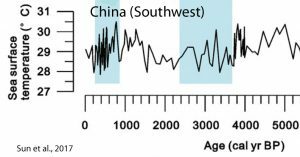 Zawiska and colleagues also point out that the rise in modern era temperatures began around 1800, not the 20th century. In fact, they find that temperatures rose by 4.3°C (from 8.5°C to 12.8°C) within 75 years starting at the beginning of the 19th century (+0.57°C per decade), and this warming “correlates with the positive NAO index and increased solar activity.” The authors further indicate that the warming in the 20th/21st centuries has been “less pronounced” by comparison. During the 19th century, of course, anthropogenic CO2 emissions rates were but a tiny fraction of what has been observed since the mid-20th century, strongly suggesting that temperature changes associated with natural variations in atmospheric/oceanic cycles (NAO) and solar activity far exceed the forcing strength of anthropogenic CO2 emissions. “According to presented reconstruction, climate shifted towards warmer conditions during 1150–1250 CE, as mean July temperature raised to 12 °C. 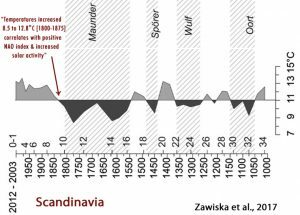 Studies from Finland and Sweden also indicate short climate warming around 1200 CE (Luoto and Helama, 2010; Osborn and Briffa, 2006) … The above described time interval 1000–1250 CE coincides with the MCA [Medieval Climate Anomaly] that occurred around 950–1250 CE and was regarded as a generally warmer and drier period (Mann et al., 2009). 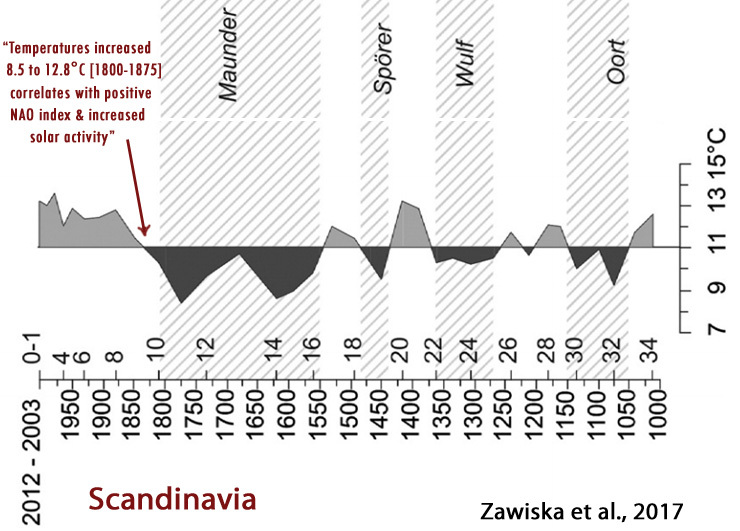 The temperature reconstruction from Lake Atnsjøen indicates that recent and ongoing climate warming began already in 1800 CE following the LIA. Temperatures increased very fast, from 8.5 to 12.8 °C during the first 75 years, but in the 20th century the increase became less pronounced. Another scientist just published a paper in the journal Palaeogeography, Palaeoclimatology, Palaeoecology that also concludes solar activity drove variations in the East Asian Monsoon (EAM), El Niño Southern Oscillation (ENSO), and the centennial-scale cooling periods corresponding to the Oort, Wolf, Spörer, and Maunder sunspot minimums. 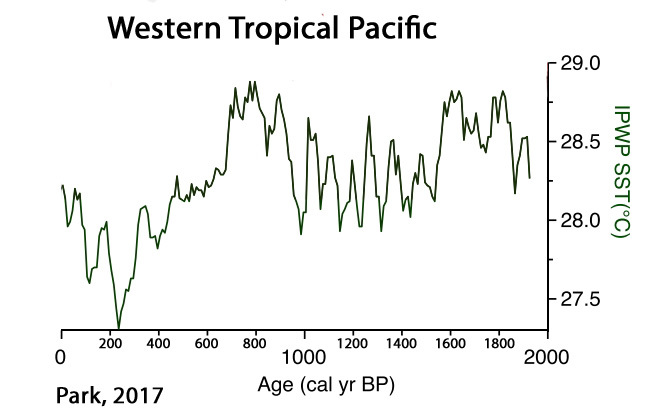 In his graph of Western Tropical Pacific sea surface temperatures (SSTs), notice how Park (2017) also documents a dramatic warming event occurred beginning about 1800, with the SST warming rate and amplitude far exceeding that which has occurred in recent decades, once again demonstrating the lack of correlation between anthropogenic CO2 emissions and surface temperatures relative to natural variation. The year has just begun, and, in addition to the 3 papers introduced above, there have already been several other 2017 scientific papers published in scientific journals documenting a robust correlation between solar activity and climate changes. With the rapidly growing body of evidence that has been accumulating within the last few years, it can no longer be said that it is “settled” science that the Sun and its modulation of natural atmospheric/oceanic oscillations (NAO, ENSO, PDO, AMO) has only a negligible influence on climate. The claim that we human beings predominantly drive climate changes with our CO2 emissions is increasingly being challenged, if not categorically undermined, in the peer-reviewed scientific literature. Some 8-10 years ago, before I jumped into the argument, I looked up either the first or second IPCC report and found something to the effect that they Expected a ‘slight cooling period’ to begin around the 2030s. I’m pretty sure that expectation has not shown up in subsequent reports, and I can no longer find my way back to it in those first two reports. And despite anything sod will attempt to claim, YES, it *was* in at least one of those reports and I did read it. I suspect it went away when the hockey schtick showed up, because if anything a cooling period would contradict claims of rapid, unstoppable temperature rise. Hmp. Well I know I said some things in the past that might have put me on moderation, but pretty sure that past is long dead. Can I come off that list please? There’s no list. It just happens with Pierre’s wordpress settings. Happens to me as well, on and off. So ClimateOtter, just keep patient. “A connection from Arctic stratospheric ozone to El Niño-Southern oscillation” by Fei Xie1, Jianping Li1. Basically they model the El Nino/La Nina very accurately using solar data! induced Victoria Mode anomalies link to the North Pacific circulation that then influences ENSO. help to improve ENSO predictions. Yes, it’s been added to the 2017 collection, which already exceeds 40 papers. it seems like temperatures rose after solar activity rose in the early 20th century warming period according to that chart plus the solar minimum of 2008/2009 was the deepest since 1913 and cycle 204 is the weakest in a 100 years I do not think solar activity is higher now than in the early 20th century. They knew this 14 years ago! This is curve fitting at its best. So this is your “rebuttal” to the scientific papers above that affirm climate change is robustly correlated with solar activity? No. That is my reply to the graph you added to the top of your post. It is curve fitting at its best. I can actually give that graph nearly every form by just changing the offset. But you can surely explain to me, what physical mechanic is making “offset -40” the one and only real one! “The sun spends about 70% of its time at moderate magnetic activity levels, about 15 – 20% of its time in a grand minimum and about 10 – 15% in a grand maximum. Modern solar activity corresponds to a grand maximum. …. 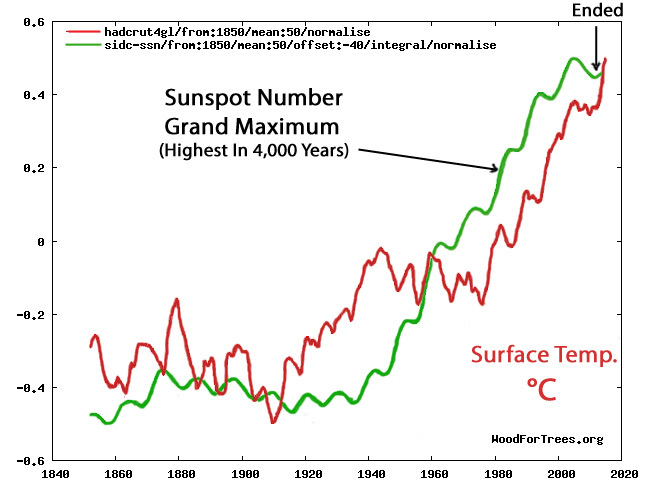 The modern level of solar activity (after the 1940s) is very high, corresponding to a grand maximum”. The STUPIDITY of using an offset of -80 defies explanation even for someone as moronic as sop. Since there is no warming from 1850 to 1920, it makes sense that the average sunspot number is approximately the “hold steady” value, so the off-set used should be the average of the sunspot number from 1850 to 1920..
using an offset of -80 is just pure ANTI-SCIENCE and a blatant attempt of DENIAL of nature solar forcing. Just like we have come to expect from sop… it lives in a wasteland of WILFUL DENIAL of nature and science. The trick is the real hockey stick! You’re averaging, then you’re integrating? What’s the purpose of that? Do you want to estimate the effect of temperature on an ice mass? Not me. It is the graph at the top of this discussion! …so the offset of -40 when looking at solar warming/cooling is about right. Only a MORONIC IDIOT would use an offset of -80. But, it is sop, so that is to be expected. Oh! I didn’t notice averaging is on one time series and integrating on the other! Sorry! I was not able to get a plot displayed when I made that comment, just got a list of numbers. Works now so I see what you’re trying to do there. Sod-the-science-denier rejecting peer reviewed science papers due to his religion. Sweet. Given that there is a pause for the last 18 years, the following temperature raw data from around the world up to about 14 year ago probably isn’t going to change much. There is NO global warming, at least not without fraudulently “adjusting” the data. BBC radio had a piece today about how Icelandic clams have revealed water temperature changes over the last 1000 years, mentioning previous heresies that solar effects can be seen, and that over 1000 AD to 1800 the sea changes came first, the atmosphere followed. Has the BBC changed its spots? … no way, they reassured us that the CO2 warming signal is still clearly evident in the last 200 years. They also explained why those darned sceptics have become so distrustful of experts, apparently its because by explaining science certain people think they know enough to be able to reject what they are being told, something known to all religions … never explain it, or it will collapse. Meanwhile the sun is blank! SUNSPOTS VANISH, SPACE WEATHER CONTINUES: So far in 2017, the big story in space weather is sunspots–or rather, the lack thereof. The sun has been blank more than 90% of the time. Only one very tiny spot observed for a few hours on Jan. 3rd interrupted a string of spotless days from New Years through Jan.11th. Devoid of dark cores, yesterday’s sun is typical of the year so far. http://www.landscheidt.info/?q=node/280 and all those complex cycles. That’s my preferred source. I think he’s a lot more objective than NASA, and others. Actually, believe it or not, today there was FINALLY some proof of climate change! For years, the warmists have been postulating the appearance of “climate refugees,” who would head north due to increasingly hot weather. Today, the San Diego Chargers announced that they are going to be relocating to Los Angeles – about a 2.5 – 3 hour’s drive *north* up I-5. That must be due to climate change as well! And don’t forget the Colts moved from Baltimore to Indy. That was back in ’84, so climate change has obviously been going on for a long time, and athletes are far more attuned to it than anyone else. p.2. that’s all the way from 39.2904° N to 39.7684° N.
Sunspot numbers directly contradict temperature record. No correlation what so ever! That graph also has zero correlation to temperature increase! you need to add a couple of tricks to produce a correlation! Trying to PRETEND, even in your own feeble mind, that there is not a LARGE increase on sunspot numbers/solar activity over the latter half of last century is really one of the most PATHETIC attempts at DENIAL I have ever seen… even you do, sop. The mathematical stupidity to produce what you produce, can only be put down to you being one of the most ignorant or internally corrupt people on the planet. … even from you, sop. 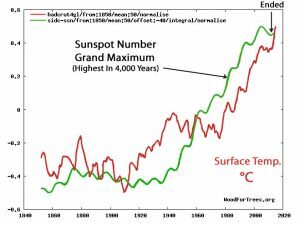 So why is it that solar scientists keep documenting solar activity hockey sticks, and they say that the Modern Grand Maximum (1950-2009) is the highest for thousands of years? Has any one done any studies on the changes in UV frequency during solar cycles? The UV frequency apparently makes quite a difference to penetration into seawater. PATHETIC attempt, using absolutely MORONIC mathematical procedures.. But its all you have, isn’t it sop. let’s change the off-set shall we. Just to show everybody the totally PATHETIC SCAM that sop is trying on. using an offset of 80 is just pure soppy nonsense. I will repeat my simple question: Why is an offset of -30 or -40 “true” and gives a good graph (one that seems to explain temperature changes), while other offset numbers (the ones given by me) are bad (as they produce very little correlation)? I am really curious and ready to learn! I have explained it 3 or 4 times!! So if you are above that average, like you are over ALL of the second half of last century, you should get warming up to another equilibrium temperature, barring other influences. His/her/its CRAP cannot be left unanswered, if not for the vain hope of actually educating it, but for any other readers. If you leave its CRAP sitting on the walkway.. the unsuspecting will tread in it. While there are some other minor forcings that we may or may not have found yet, it is very obvious that Solar activity is a major player. 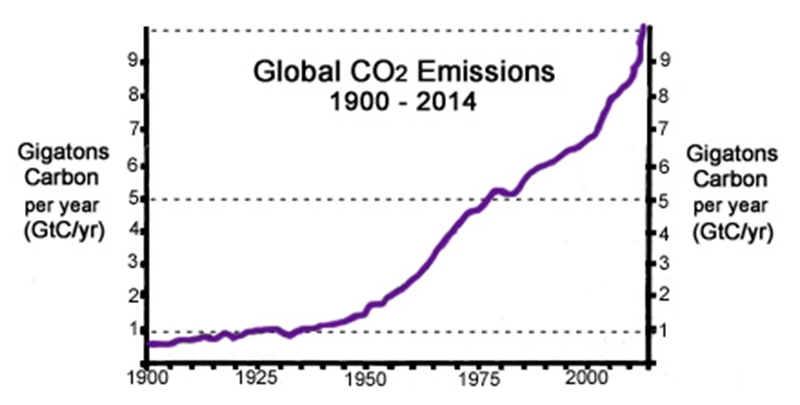 On the other hand, there is absolutely nothing to indicate that CO2 has any warming effect what-so-ever. The ABSOLUTELY BENFICIAL rise in aCO2 being purely from natural ocean warming with a little help from humans burning sequestered carbon deposits. If however, you take the weighted (0.5, 1,1) 3 cycle average of sunspots and delay it somewhat, as per David Evans’s theory, you end up with a nearly flat trend from 1979 to 2015, which, discounting El Ninos, is a very close match to the satellite temperature series. Still have a bit of investigation to do with the data, but with a bit of natural AMO and PDO to give the 1940’s peak then cooling to 1970, a pretty close match to reality should be possible. These are all KNOWN, PROVEN factors influencing temperatures, unlike CO2 which is proven to have no effect whatsoever. should be PDO not OD. !! DOH! If that’s true, why are scientists continuing to find that ocean temperatures still much colder than they’ve been for most of the last 10,000 years even with the dramatic rise in atmospheric CO2 in the last 100+ years? When will this dramatic warmth from “man’s emissions of GHG’s” actually start to affect temperatures beyond the range of natural variability? What about the other areas of the ocean not covered by this paper? What is the science behind their assumption? The World ocean is much bigger than the N Pacific + Antarctic Current, obviously. As indicated in the article itself, their new paper (2017) covers more than just the “N Pacific + Antarctic Current”. They insist in the paper their coverage is comparably as “global” as Levitus et al. (2012). Why aren’t you answering the underlying question rather than getting so caught up with these coverage tangents, David? Is it because you know you don’t have a good answer as to why today’s ocean temperatures are still much colder than they’ve been for nearly all of the last 10,000 years despite today’s high CO2 levels? 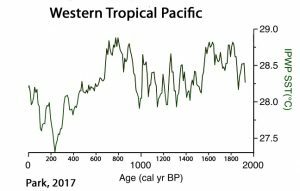 Why was the Pacific Ocean so much warmer than now during the Medieval Warm Period, David (Rosenthal et al., 2013, 2017)? What caused that warmth, since CO2 levels were in the 270 ppm range? Answer the question. That is *not* what this paper says. Last time I looked, there was much more ocean than that. So again I ask you, David, if human CO2 emissions are going to prevent natural variability/solar activity from affecting climate changes to any significant degree, as you believe, why hasn’t this phenomenon of CO2 emissions heating the oceans happened yet? 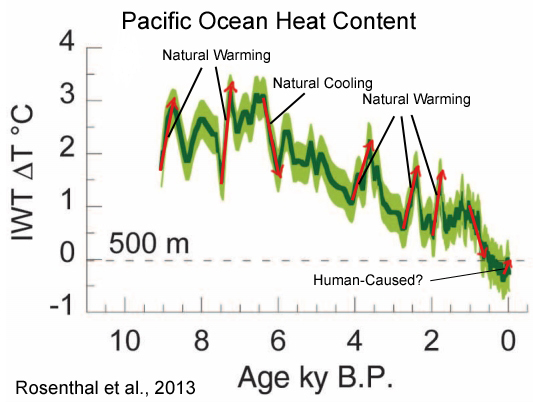 Why are today’s ocean temperatures still much colder than nearly all of the last 10,000 years? After all, CO2 concentrations are much higher than they were when ocean heat content was significantly higher, and CO2 emissions were flat. So why do you believe what you do? Rosenthal et al are for the North Pacific and Antactica. To make global conclusions, one needs global data. So what global data are you using to make your conclusions? I am not the one claiming that Rosenthal et al. (2017) represents the global ocean. The authors of the paper are the ones making that claim. I don’t agree with them either that their data is – or could be – a global representation. Again, try to focus on the actual question here rather than getting sidetracked trying to figure out why Rosenthal et al. (2017) claim their coverage is for the “World Ocean”. Why were the Pacific and Atlantic Oceans so much warmer than they are now back when CO2 levels were in the 260s and 270s ppm…since you believe CO2 concentrations are the primary determinant of (regional) ocean heat? I don’t believe Appell does believe half the crap he comes out with. Who is paying you to LIE, rotten-appell? What happened to the Antarctic data they had in 2013? Again, I am not the one making the claim that the data here represents the global ocean. The authors of the paper write that. Obviously this is nothing more than a diversionary tactic. You don’t want to answer the actual question I keep asking, and you keep pretending this question isn’t being asked: Why were the above oceanic regions all warmer than now for most of the last 10,000 years when CO2 concentrations were in the 260s ppm while they were so much warmer? How many more times must I ask this question, and how many more times will you continue to avoid it by pointing out that the Rosenthal papers don’t represent the global oceans — a point I have already told you I agree with? Whatever they’re paying him, he isn’t worth it. Surely you don’t think that atmospheric CO2 is the only factor that can influence climate. What was/were the mechanism(s), David, if you acknowledge it wasn’t CO2? Kenneth, I noticed how you tried to slip in “Pacific Ocean” there, when the data only pertain to the Northern and equatorial Pacific Ocean. There is insufficiente data to say where that heat came from. Perhaps it was heat exchange with the Atlantic and/or Indian Ocean and/or southern Pacific Ocean. Your notion that all change must be due to CO2 is ridiculous, and naive. Do you think the Sun and variations in albedo might have contributed to heat changes in oceans? If so, how much? Um, David, that isn’t my “notion.” I have never written anything of the kind. I do not share your beliefs. I would appreciate it if you would refrain from making up “notions” and then claiming I have written them. I’d have to study this issue to understand it in more detail. Probably not likely. But your apparent notion that any other warming any other place any other time means CO2 isn’t a strong greenhouse gas causing most of today’s warming is absolutely ridiculous. We know very well what CO2’s radiative forcing is. Something that happened 10 or 20 kya doesn’t change the molecular properties of CO2. Of course. Yes, I understand that you are “probably not likely” to understand why OHC naturally rises and falls at magnitudes and rates that far exceed the modern period’s changes. That would require you to consider that OHC changes might be far more influenced by factors other than 0.000001 fluctuations in atmospheric CO2. Don’t investigate, just keep on believin’. We “know” what the models say it is. CO2’s radiative forcing influence on OHC has never been observed. Nor has it ever been subjected to a scientific experiment. But that’s what your version of climate “science” is based upon. Its been proven to you over and over and over again. CO2 has NO influence on climate except by data adjustments to meet the anti-CO2 scam. There is absolutely NO CO2 signal in real temperature data or real sea level data, or anywhere else. NONE WHAT SO EVER !! Is there a reason to think it’s different than on land? The heat capacity of the ocean is 1,100 times greater than the heat capacity of the air. Do you consider that’s a substantive difference? Again, the rotten appell uses the Feldman paper he knows PROVES NOTHING. They started at the bottom of an El Nino, and ended at the top of a La Nina, and pretend to have found a tiny increase that would come purely from the temperature increase. The result is MEANINGLESS, and he KNOWS it. But he MUST keep up with his blatant misinformation, because misinformation is all he has. And anyway, according to the Feldman paper, the +0.000022 (22 ppm) increase in atmospheric CO2 concentration during 2000-2010 elicited a RF value of 0.2 W m-2 during those 10 years. According to Stephens et al. (2012), the radiative imbalance for the same 2000-2010 period was estimated to be +0.6 W m-2 (with an uncertainty of 17 W m-2, which is more than 10 times greater than the assumed forcing for both the radiative imbalance and the estimate of forcing attributed to CO2). A radiative imbalance of 0.6 W m-2 over 2000-2010 means that CO2 only caused 33% (0.2 of 0.6 W m-2) of the radiative forcing for that period. That means that something other than CO2 was the predominant radiative forcing (0.4 W-2). What was it, David? 2000-2008 might have been interesting. Also why did they take FIVE whole years to publish such an “important” paper.?? It would have sailed through pal-review. Did it take that long to statistically tease out the tiny amount they say they found ? Or did the test data actually finish in say 2012? The big question is WHY/HOW did this paper ever get published with such a meaningless result !!!! 2) Do you really honestly not understanding the irrelevance of your claim? Kenneth, if you do not understand that, at least, you are simply note qualified to preach about climate, and I’m just going to ignore you. Because that is really a dumb statement. That’s about as likely to happen as your claim that you’re “done” here, that you will no longer post here…that lasted about 10 days. Do you consider yourself a man of your word, David? Kenneth, according to NOAA data, the decade ending 12/2010 was +0.20 C warming than the 10 years (120 months) before. The gray and white areas have no thermometers. No data. 80% of the globe (at least) has no temperature data available. So, instead of using actual measurements, NOAA just makes it up. They use “in-filling” based upon computer models rooted in their own biases. The MetOffice/HadCRUT do the same thing. In fact, ClimateGate showed that they admit they just make up sea surface temperatures for most of the SH. In contrast, as Dr. Spencer explains, the satellite temperature dataset coverage extends to “every cubic inch of the lower atmosphere” on a daily basis. For your convenience, I included both the RSS and UAH temperature data for the 2000-2010 cooling trend. According to the Feldman et al. (2015) paper, modeled CO2 forcing was 0.2 W m-2 for 2000-2010, when satellite data show that global temperatures cooled. So CO2 had no effect on global temperatures during that period. Why do you think that is, David? And according to Stephens et al. (2012), the radiation balance for the globe was 0.6 W m-2 for 2000-2010 (with an uncertainty of 17 W m-2). So assuming you agree with that “settled science”, what caused the other +0.4 W m-2 of radiative forcing for those 10 years…when the temperatures cooled? Can you answer these questions? There is NO SUCH thing as NOAA data. you KNOW that.. so that makes you a DECEITFUL LYING PIECE OF ****! !